I came up with this thread after I cleaned up, so no pics, but I will post pics in the future. Technically I'm not following the rules...but I felt like posting. I just wanted to bump this to the top. I think this is a great idea. I need to figure out meals for the next week. This could be a good way to get dinner ideas! Sidenote: I recently started compiling recipes for a cookbook I want to put together. It's much harder than I thought. Anyway, I am all about food these days. Had BBQ wings last night w/ little red potatoes cooked in a frying pan w/ olive oil, garlic and rosemary. Turkey and gravy with noodles. Cranberry and squash on the side. Mini Thanksgiving type dinner! Sorry no pic...maybe I will snap a shot of the leftovers though. Edited by tkdryan, 06 January 2011 - 02:06 AM. Tonight is crock-pot chicken w/ cream of mushroom gravy, carrots and spices over noodles. Last night I made fish tacos (Chef Aarti Sequeira's recipe). They were really easy and yummy. I served a cucumber salad along side. I just made the dinner menu for the next few days. I'm curious, who else makes a weekly dinner menu? I find that if I plan ahead enough, then I don't make so many trips to the grocery store. I'm making chicken breasts. Salt lightly, marinate in Tapatio sauce, and sprinkle heavily with a locally made seasoning thats like Montreal steak seasoning but even better. Baked in the oven in a cast iron skillet. This is Baked Patti Pan Squash and Egg with Green Chilies, Onions and melted Cheddar Cheese. 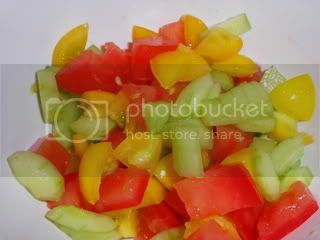 Fresh Salad with Tomato and Summer Squash on the Side. Cut the top off the patti pan and clean out the center to make a nice cup, bake at 350 for 15 minutes, on the side cook in butter the onions and green chilies with some salt and pepper, when the patti pan is getting soft pull from oven and pour the onions and gr chilies into the patti pan, add a raw egg on top of that and the cheese, place back in over till egg is cooked the way you like it. Patti Pan should be of large size 3" across or so. When adding the cook onions and chillies and egg you want this mix to just fill the patti cup. 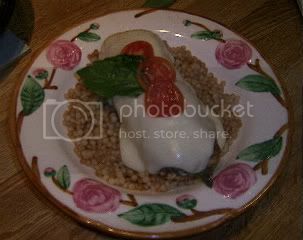 It's a chicken breast stuffed with mozzarella, basil and sun-dried tomatoes. Roll in Italian-herb bread crumbs, brown in a pan with olive oil and then bake for 30 minutes. It's served over Israeli couscous with a garlic cream sauce. pork chops, mashed sweet potatoes, string beans, biscuits, and applesauce. Sweet Italian sausage with peppers & onions on big soft rolls. Singed the peppers & onions a tad, but not enough to make them taste bad. I'm normally not a huge pepper or onion fan, but if they're cooked well and used sparingly, I don't mind them. Hey Grandpa! What's for supper?? Parmesean haddock w/ white basamati rice, salad and/or beans. Who are you people?? I'm lucky if I can cook "real food" on the weekends...almost never during the week!. I did make arroz con pollo this weekend, which is easy and delish. and maybe now it's time. Let's see what I can do here! thanks for the inspiration! Well, I'm a domestic diva so I have the extra time. I love being in the kitchen these days because the kids hang out in there with me and play and laugh and I have my jazz or lounge music playing. Plus, I'm attempting to put together my own cookbook so I find myself in the kitchen a lot. The other night I made the Indian Chicken/Spinach dish and I cannot believe how good the house smelled! The chicken was SO good.